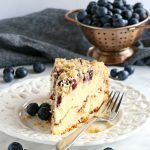 This Best Ever Blueberry Ricotta Coffee Cake is the perfect moist and fluffy coffee cake made with low fat ricotta, and packed with fresh blueberries, cinnamon sugar, and the best crispy streusel topping! In a large bowl combine the ricotta, sugar, eggs, lemon juice, vanilla, and melted butter with a wire whisk until well combined. Combine the brown sugar and cinnamon in a bowl and sprinkle half the mixture over the amount of batter in the bottom of the pan. Sprinkle the remainder of the cinnamon sugar over the top of the batter and add the blueberries to the top. Sprinkle the streusel topping evenly over the top of the blueberries.